Again, a selection in traditional or contemporary style. The former may feature decorative porcelain and be hand finished, the latter might include single or double ‘Vanity’ units, a freestanding washstand piece or a wall cabinet with doors from double-sided mirror. 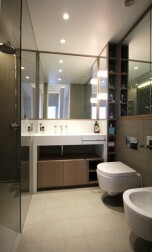 Spray-painted Vanity Unit with mitred stone top and Walnut drawers and interior. 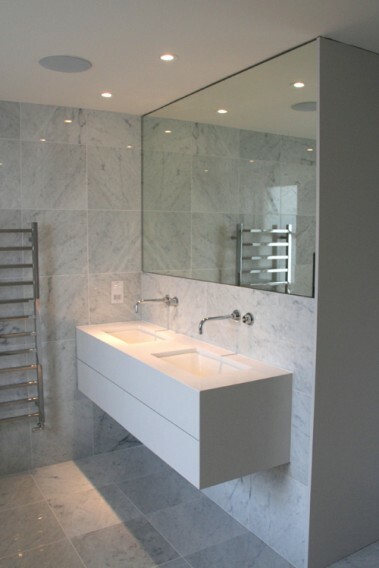 Mirrored door cabinet recessed into wall with a white sprayed interior. 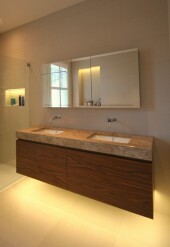 Walnut Vanity unit with two basins and stone top. Wall cabinets made from Walnut with tarnished brass door frames surrounding bevelled mirrors. 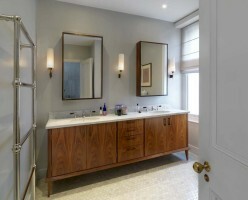 Art-Deco style Bathroom made from solid Mahogany, veneered Vavona panels and Maple inlay. Parquetry floor star made with Mahogany, ripple Sycamore and Ebony veneers. 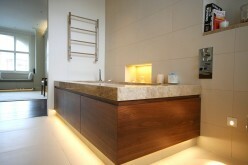 Walnut Veneered Bath Panel with integral lighting. Wall-hung Walnut veneered Vanity unit with drawers and stone top. Vanity Unit and wall insert made from Maple. 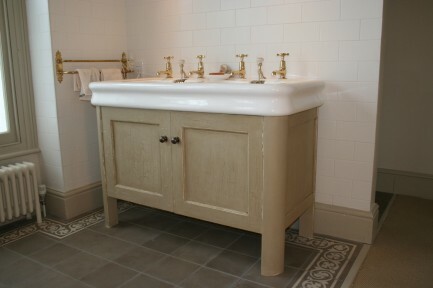 Hand-painted Bathroom cabinetry and room panelling. 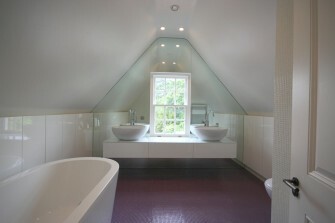 White Corian Vanity Unit with custom Corian shower tray. Oak cabinets stained in a grey wash stain. 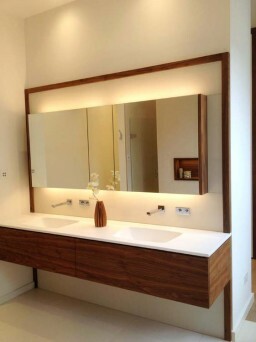 Walnut wall-hung Vanity Unit with Corian top and basin. Mirrored door wall cabinet with Walnut. 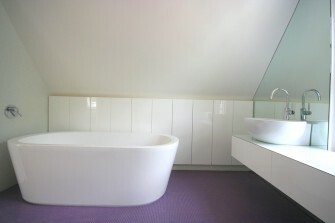 Children’s Bathroom Vanity Unit and cabinets made with a white gloss lacquered finish. 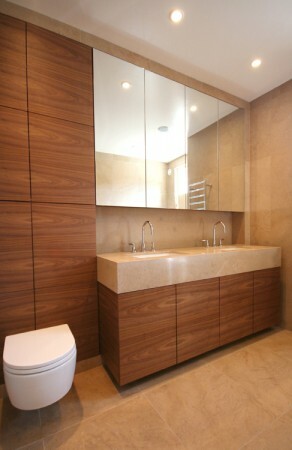 Walnut Bathroom suite with stone top and mirrored door cabinets above. Vanity Unit made with a distressed paint finish. 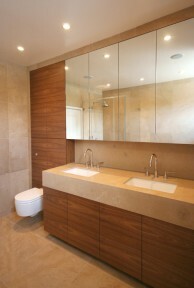 Bathroom Cabinets made from quarter sawn Oak with Cararra marble top. 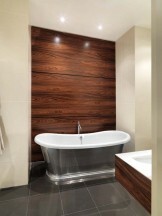 Wall-hung Washbasin unit and wall panels made from Santos Rosewood. Walnut Vanity unit with ceramic basin. 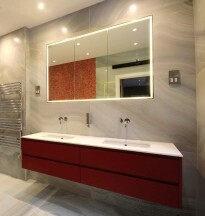 Red lacquered vanity unit with recessed mirror door wall cabinet with concealed perimeter lighting. 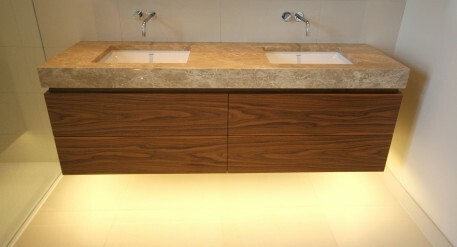 Walnut Vanity Unit with composite stone top, glass splashback and mirror door wall cabinet with lighting. 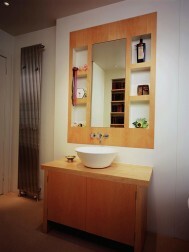 Vanity Unit made from solid Teak. 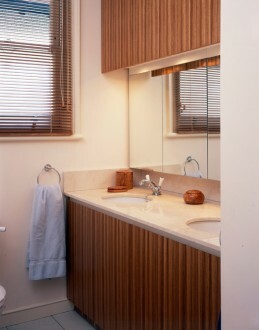 Bathroom cabinets made from Zebrano veneer. Upper and lower cabinets made from Ebony. Mirror door with integral star lights. Cararra marble vanity surface. 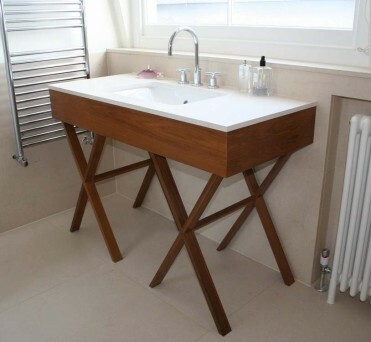 Walnut washbasin stand with polished stainless steel plinth. 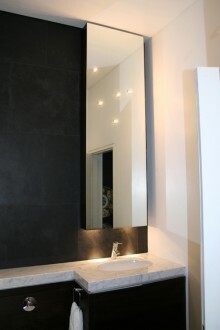 Recessed mirror door wall cabinet.